Bald River--+Big Pine Camp+--Bald River--Holly Flats Road--Brookshire Creek--+Horse Camp(2)+--Brookshire--Holly Flats Road--Bald River--+Black Cave Camps+--Bald River and OUT. Okay boys, this trip is special in that Little Mitten decides to join me on an end-of-the-year trip to watch 2005 become 2006. It's our New Year's Trip. And it snows, too! Here are are at the start of the Bald River trail before the Gorge climb. 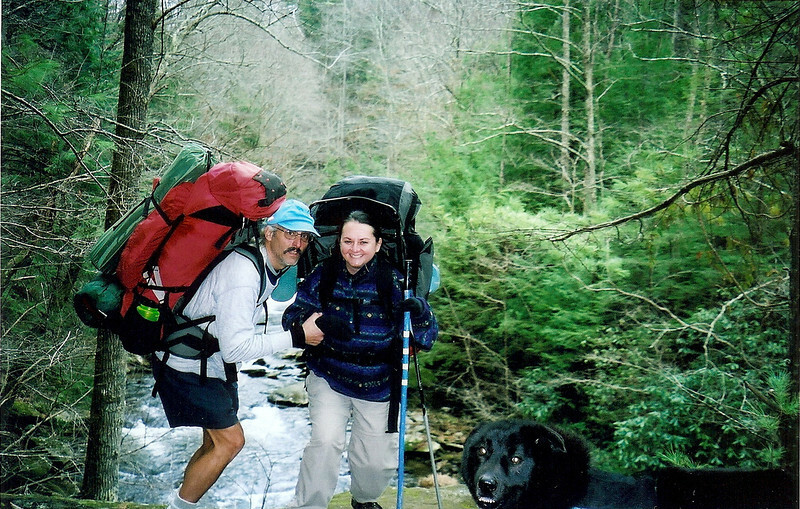 The truck was loaded with 3 packs and we drove up the Tellico River road and parked at Baby Falls to begin another trip into the Bald River Wilderness with Little Mitten and Shunka dog. We are now stopped at the swimhole rock with the packs off and the sandwiches out, resting and listening to the loud high water of the mighty Tellico. In the distance 3 dayhikers approach and will pass us by and just did pass us by, all hailing from Madisonville. They asked, "Does this trail go to Green Cove?" but it sure doesn't. It's cloudy and we better get moving. OVERNIGHT AT BIG PINE CAMP: Ok, here we sit at a small fire after a meal of pasta and green tea while I watch Mitten build up the small twig fire. She's across camp in the Light Wedge tent and I'm over in the Nammy 3 green jewel so she'll have her own little nest to enjoy which is all anyone would ever need while camping. Sharing a tent is only a good idea when survival is at stake, the rest of the time solitude is more important than a lighter pack so I strongly recommend a tent for each person. Mitten is in a very good mood as she banks up the fire and we sit talking and laughing and both danged glad to be out again after an 18 month break since our last trip into Pisgah forest. This trip is different as it is not difficult, there's no climb to kill the spirit, there's water nearby soothing the soul and a wide open campsite big enough for our separate tents. This will be Mitten's first time in a tent alone in 44 years and that is amazing. The fire is out and all is lost! She's squared away and with stars in the night sky all is well. The river sings nearby and it feels good to be here camping beneath the big pine. I hope we both sleep long and deeply and first light comes quick. Our last trip or one of our last trips was not so joyful but so far all seems good. My new thermy is a large Expedition model, 77x25x1.75, the perfect winter pad. With it I ordered a stuff sack and so all I do is roll it up, wrap it with my silnylon tent tarp and slide both into the sack where it is lashed onto the outside of the Dana pack on the back between the 2 pockets. By doing so I make room inside the pack for other things and it is easier to roll up the thermy this way and the tarp further protects it from punctures while hiking. It's a good system all the way around. Tomorrow we hope to continue our journey up Bald River and pass Holly Flats camp and Sky Ranch to the Henderson and Upper Bald River both to reach Horse Camp where we can set up camp and build a decent fire. She'll like it and with a little luck they'll be firewood for the taking. After that we'll just see where we're at, maybe a climb up Brookshire Creek to a high camp below Sled Runner, maybe a high camp at Beaverdam Bald or Water Gap, maybe we'll just hang out at Horse Camp till Friday and leave it all the next day. She'll love the Upper Bald area and I am looking forward to it myself. Pilamaya Tunkashile for the opportunity to sit inside nylon and to hear the creek nearby and to be out with my two loved ones in the new year of 2006. It's a dark night but I am up and wide awake in Defcon 5 waiting to shed layers and hit the sack. I am thinking of Willow's trip on the AT which will be coming up in 3 months whereby she'll begin her 2,000 mile quest from Georgia to Maine. Like Dorothy Laker and like all the solo women hikers before her, she'll experience loneliness, fear and exhiliration and she will have to answer in her own way the several questions that will come on a daily basis: Who will I meet? How do I feel? Why am I doing this? When should I stop? I guess a book could be written by a team of psychologists about why people walk the AT and about why most people quit, there's no clear sign to prove either result. Nature is a powerful mirror and reflects without pity our real aggenda and motivations, our blemished image with warts and all. The boulevard of Nature is a strand where all must pass but few stay, most people are clear that they hate it and so never scratch the surface and so never really live, while the others like Eustace or Johnny B or dare I say myself have reached an accord of sorts though have been scarred by the Holy Indifference, by the pristine Aphrodite beauty and by the void of deep forest loneliness which confounds the most serious Nature Boy. Therefore to hike a long trail is to hike our own timeline and to journey into our own history, to find out where we came from and to find what we've lost. To say it's not for everybody is illogical and it is like saying eating or sleeping is not for everybody though it may well be true that Nautre and community go together while the opposite does not. But now that the Hoop has been broken and the circle scattered, the solitary individual in Nature is oft times the only possible solution and relief. But the crux of it comes back to Reflection, what do I see, what have I learned and why does something so complex by its very simplicity confound and terrify so absolutely? What can Nature give Walter, what can Nature give Willow? Of course it gives freedom and blissful exhaustion, it gives a symbolic journey into the wild green maze and it gives the footpath revolt from the Christian death worship, it gives a rightness and order with all things balanced in intricate beauty and its truth can be partly discovered in tribal culture and characterizations depicting Nature as God, Nature is God, Nature is, without man; without Man, Nature is still. Nature needs me to observe and applaud and then to graciously sink back down into Nature's field and embrace. Untamed wilderness is Nature and the universe is wilderness. Over population of any creature always destroys wilderness and yet macro wilderness(a meteor hitting the earth)always destroys over population. But know this, as long as a sliver of the wilderness pie still exists there is hope and individuals will be fed by it and so Willow plans to pump nylon and Walter sits in a tent and Little Mitten rests on the ground and Johnny B drank and will drink Pisgah waters and Eustace saddles a horse and everyone eats sunlight and soil and contains sperm and ovum and we dance on sky and stone strings as puppets to the air and wind and blood and rain and trees and fields of plants and bugs. Yoga is the study of our inner Nature, the wind of Om and the moon of the third eye, the spinal tree of life and the long tunnel trail of light thru the astral forest and deep causal space. No matter how hard we try we cannot escape Nature, we are therefore prisoners inside this confounding simplicity and such whiteness terrifies us, so the journey back begins with each inhalation and ends with the Unspeakable Not This which is the full unconditional embrace of Nature which all men call love. And so love is sitting on the surface of the sun and not dying, love is breathing in empty cold space and not dying, love is hiking on the hot surface of Mars and not dying, love is sleeping in the snow atop Mt Everest and not dying. Or for us neophytes and egotists, love is backpacking a 40 pound pack up a trail in North Carolina and seeing truth at even this late date and not dying.